Well what can I say, nearly a week on and I’m still blown away by this wedding! 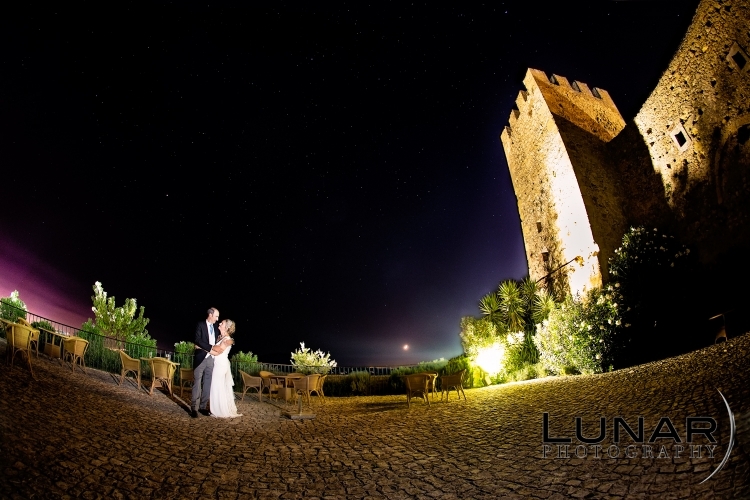 On last Friday I flew out to Portugal to capture the marriage of Francesca & Filipe. 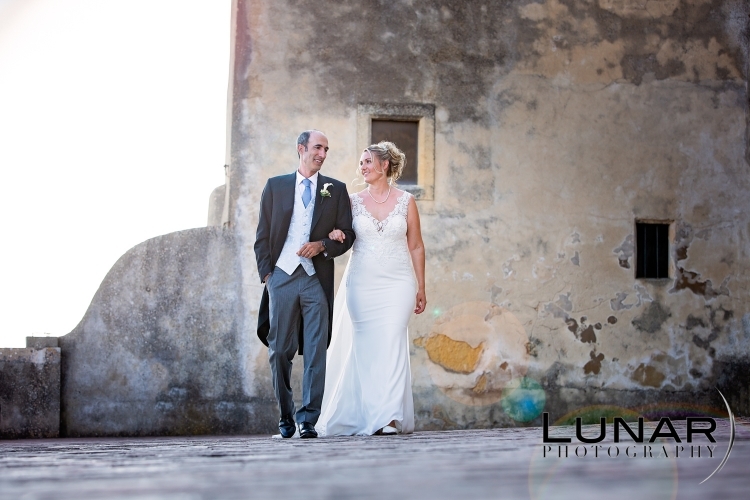 This lovely couple tied the knot in a gorgeous church located in the small town of Palmela at the foot of a castle up on a hill. The night before, all the guests were invited to a welcome meal put on in a local restaurant. This was a golden opportunity for people to meet before the big day and mingle! It also gave me a chance to get to know some of the guests and family members! It was a brilliant bonding evening and I referred to it as ‘The Wedding Day Part 1’. I hope those that were on my coach back to the hotel enjoy their tour guide from ‘Stacey’! The wedding itself went so smoothly and of course we got the 30 degree Portuguese weather to boot! After a lovely service everyone made their way up the hill to the castle which stood at its top! Here in this stunning venue with stunning views we were all treated to much needed cold drinks and given time to chat and mingle. Once the sun had moved around the castle giving us a bit more shade I photographed the family members and then took our happy couple for walk around the to explore the grounds. The views and grounds of the castle provided so many locations that had to be captured that I got a TON of heart melting photos! So many in fact that I’ve included 3 sample images below! More than I’ve ever included on Lunar’s Blog! Later in the afternoon we were led into the main area centred in a open top courtyard where there, were the tables all laid out for the evening meal. There was some lovely details including the Portuguese cockerel (also known as the Nandos chicken) and every placement (including my own) had a beautifully decorated tile with the guests name on the front and a magnet for use on your fridge on the back! The courtyard was also adorned with the Lilly’s that were seen everywhere from the church to the castle! After some hilarious speeches the food was served and boy was it gorgeous! If there’s one thing I noted about my time in Portugal it’s that the food there is amazing. I particularly have a fondness for the Pastel de Nata’s. If you ever see them in England buy every single one they have! They are to die for! The night was all wrapped up after the cake cut with most amazing DJ’s I’ve ever heard. There was 3 of them working at the same time to mix the music live and every tune they kicked out was a floor filler! Even I found myself wanting to dance and I don’t dance! I can not thank Francesca & Filipe for their hospitality from start to finish. Not only did they ensure that I was well looked after but so were their guests! From private coaches provided to 2 days worth of food and drink provided they left no stone unturned! So please raise a glass for the new Mr & Mrs Oliveira! Congratulations to the both of you and I hope you lead a happy, healthy and prosperous life together! Yesterday it gave me great pleasure to capture Alex and Peter’s wedding at Silchester House near Reading. This lovely house is hidden away in the countryside and was home to the their wedding for the day! A super friendly bunch of friends and family (some of which had travelled overseas from France) complimented Alex and Peter’s super bubbly and friendly personalities! There was so much laughter from the photos we took to the speeches and beyond! The staff were lovely and despite it being over cast all day we didn’t receive a drop of rain! I thoroughly enjoyed Alex and Peter’s special day and would like to thank them for having me along, to the staff of Silchester House for looking after me, my assistant Isla for helping out and to the warm, welcoming and funny guests! I had many a laughs quoting Ace Venture and Austin Powers Lines with them! Please raise a glass for the new Mr & Mrs Horn! On the 17th of this month I drive out west to The Manor House in Castle Combe. I was blown away as I entered the gates as this absolutely amazing venue! The grounds had clearly been manicured to perfection. The build was gorgeous with the foliage growing up the side of it. As soon as you enter the reception area the smell of wood and the authentic creaky floor boards added so much character to the place. I can totally see why Jennifer and Ash chose this venue, I myself wouldn’t mind getting married there some day. The weather was perfect all day! Not too much sun but no rain either! Jennifer and Ash added their own spin on the wedding with their love of Lego theming much of the decor on the colourful bricks. A welcome sign made entirely out of lego, the cake themed on lego with a actual wedding scene made of lego bricks. I of course helped along with this theme by creating lego themed ‘Pixelstick’ image which will be revealed at a later date. Till then please enjoy this gorgeous photo of our couple amongst the stunning ground that The Manor House Castle Combe had to offer! I’d like to wish Jennifer and Ash all the best in their new life together as newly weds! Last week I was given the pleasure to witness the marriage of Jane and Elena at Middle Aston House in Oxfordshire! The beautiful countryside grounds of this venue were home to this gorgeous house and is where Jane and Elena tied the knot along with a select few family members and friends. After a lovely ceremony there was time for some drinks and socialising amongst the two families before they enjoyed a delicious meal provided by the Middle Aston House. After that we had the cutting of the cake and the two families went on to having a lovely BBQ. The weather held out and although was cloudy it didn’t stop us going for a short walk amongst the grounds! Please enjoy this little sample from their very special day! On Saturday the 11th of August I found myself at one of the most emotional weddings I’ve ever had the pleasure of attending. Stephanie and Kyle tied the knot at the Macdonald Berystede Hotel in Ascot in what turned out to be a stunningly beautiful wedding. There was a little bit of drizzle but nothing that dampened the spirits of the guests or Steph and Kyle. Starting the bridal prep at ‘The Salon Sunningdale’ we moved back to the Macdonald Berystede to finish up getting ready. As we got closer to the ceremony start time nerves started to show. We managed to capture a magical moment before the ceremony with Stephanie and Kyle on either side of a door, not able to see each other but able to exchange a gift around it. Later we awaited Steph’s arrival and Kyle really became anxious, especially moments before Stephanie’s arrival. You could see and feel how much these two people meant to each other. With the tears rolling down Kyle’s face before Stephanie had even entered the room, it really hit me with emotion. But as soon as Kyle saw his gorgeous bride that face turned to a beaming smile! We all had a great day with plenty of amazing photo’s throughout. I especially enjoyed the ice cream bicycle! I’d like to thank Stephanie and Kyle for having me be part of their amazing day! Please enjoy some of those moments that were captured on the day and displayed on the day below! More to come soon!